Whole Fruit Juicers – Can They Help Keep You Healthier? It’s no secret that fruit juices are a nutritional powerhouse, packed with vitamins, antioxidants and phytochemicals that boost your immune system and improve your overall health. Whole fruit juicers allow you to juice quickly by adding whole fruits such as apples straight into the machine. But do juices made with whole fruit juicers offer any benefits over the juices you can buy off the shelf? You can find many brands of fruit juices at the grocery store or health food store that claim to be fresh or ‘natural’, and sport a quick expiry date to go along with it. But are they really the same as drinking juice that has been freshly squeezed and consumed right away? They may be close, but they are not the same. Most of these bottled juices have been pasteurized. That means they have been heated in order to kill off any pathogens. The problem with pasteurization is that along with the bad stuff…it kills off some of the good stuff too! The levels of vitamins and other nutrients in pasteurized juice simply is not the same as freshly squeezed juice. And as these juices are shipped and sitting on the shelf, their vitamin levels degrade even further. 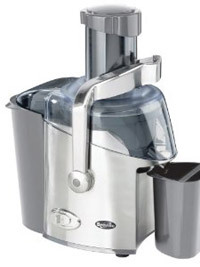 In the photo above you can see the Breville JE24 whole fruit juicer. Here is more information about Breville juicers including my review of this whole fruit juicer. What about regular store-bought juice? Many of these juices have a whole host of additives. High fructose corn syrup, preservatives, artificial flavors and colors…all of these ingredients are not things that support good health. Many juices are basically sweetened, flavored water, with vitamins added back in. Whole fruit juicers let you drink juice in the way that nature intended. Because you are squeezing the juice from fresh fruits and drinking it right away, you get all of the vitamins, antioxidants and other beneficial nutrients in their natural form, and in the proper concentration. Nothing artificial is added…you know exactly what is in your juice. Electric models are quick and powerful, and let you make a larger quantity of juice at once. They handle all of the peel, pith, seeds and pulp…all you need to do is throw your fruit mixture in the machine and hit the button. You can mix a variety of different fruits to make your own, special powerhouse blend. So can whole fruit juicers help keep you healthier? The answer is a definite yes!